90a. Pholiota flavida var. graveolens var. nov.
Pileus 5-7 cm latus, late convexius, visciduis, glaber, sordide luteus. Contextus luteolus; odor graveolens. Lamellae adnatae, latae confertae, luteae demum castaneae. Stipes 9-13 cm longus, 7-9 mm crassus, sursum luteolus, deorsum subcastaneus, sparse fibrillosus. Sporae 8-10 x 4.5-5 µ. Pleurocystidia desunt. Cheilocystidia 23-36 x 5-8 µ, subventricosis saepe irregularis. Specimen typicum in Herb. Univ. Mich. conservatum est; legit prope Priest Lake, Idaho. 26 Sept. 1964. Smith 70814. Pileus 5-7 cm broad, plane with a decurved margin, viscid, glabrous, dingy honey-tan where not covered with spores, fading to dingy ochraceous (chestnut where covered with deposited spores in age). Context pliant; odor heavy and like some fats, taste mild; FeSO4 no reaction, KOH no reaction. Lamellae adnate-seceding, dingy yellow, becoming "auburn" from spores, horizontal, fairly broad, close, edges even. Stipe 9-13 cm long, 7-9 mm thick, equal, yellowish pallid at apex, dark rusty chestnut from base up, thinly fibrillose from a very thin veil which leaves a few indistinct patches on the cap margin, cortex colored. Spore deposit "chestnut" to "auburn" (with a strong red tinge). Spores 8-10 x 4.5-5 µ, smooth, apical pore distinct, wall thickened (0.3-0.4 µ); shape narrowly elliptic to ovate in face view, in profile somewhat inequilateral to subovate; dingy cinnamon or paler in KOH, more reddish cinnamon in Melzer's reagent. Basidia 23-29 x 7-8 µ, 4-spored, yellowish in KOH or Melzer's. Pleurocystidia none; cheilocystidia 34-47 x 4-12 µ ventricose near base and with a crooked neck ending in an obtuse apex. Thin-walled. Gill trama with an indistinct cellular hymenium, central area of smooth inflated hyphae (to 25 µ). Pileus epicutis a pellicle of gelatinous hyphae 2.5-6 µ diam., yellow in KOH but fading; hypodermium yellow in KOH. Clamp connections present. Habit, Habitat, and Distribution: Caespitose at base of a conifer stub, near Priest Lake, Idaho, Sept. 26, 1964. Smith 70814. Observations: The color of the spore deposit is that of the type variety but the peculiar odor seems to distinguish it. The fresh specimens reminded one of Pholiota mutabilis except that the stipe was not scaly. The color of the spore deposit is a variation in the direction of the genus Psilocybe. 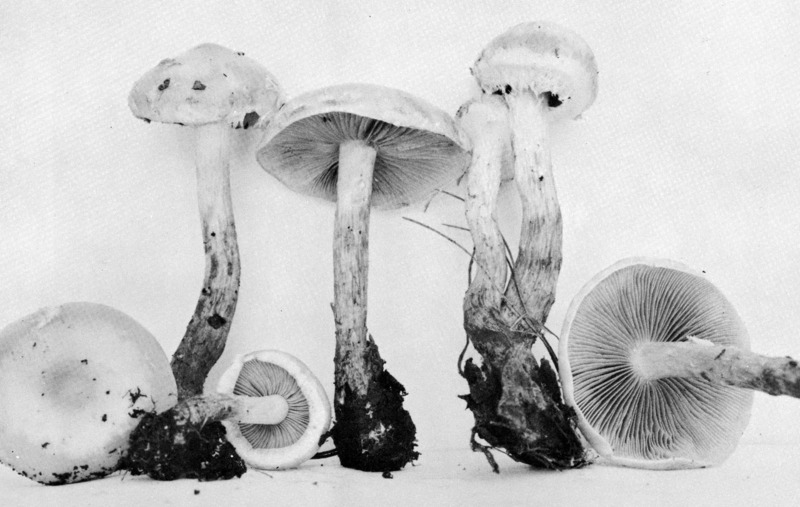 The anatomy of the basidiocarps is that of the P. alnicola group.